Sistren in the Vivienne Westwood & Burberry campaign photographed by David Sims. There are quite a few fashion predictions one can feel confident about making for this year: Veganism and sustainability will continue to be hot-button topics in the industry, everyone will want to wear anything from Valentino/Marine Serre/Paco Rabanne, influencers will continue to influence, hair clips are going to be the new statement earrings, Millennial Pink is here to stay, and Burberry’s vintage check will be the most identifiable pattern. I can feel it already. Riccardo Tisci’s first full runway collection will undoubtedly inspire a number of women to revisit the luxury brand’s offering. The first section of the spring 2018 catwalk, with its sophisticated neutral color palette and flattering shapes, sealed that deal. However, it’s not the only part of this storied fashion house he has artfully approached since stepping in as chief creative officer last year. 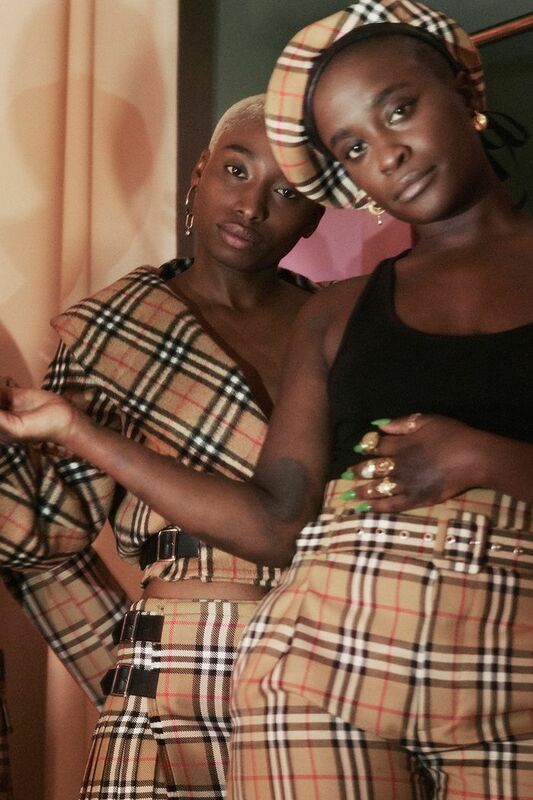 The former creative director of Givenchy has established both a new logo inspired by founder Thomas Burberry and (time would only tell, right?) and reworked the most recognizable style signature of them all: the brand’s icon plaid. Kate Moss in the Vivienne Westwood & Burberry campaign photographed by David Sims. As seen last month on Kate Moss in a resplendent matching checked shirt-and-trousers co-ord from the brand’s hotly anticipated collaboration between Riccardo Tisci, Vivienne Westwood, and Andreas Kronthaler, this was further confirmation of what I had started to sense. No other fabric has experienced highs and lows quite like Burberry’s checks. With legacy and a certain appeals-to-all allure comes a great deal of affection, and I’m ready to dive head first into it again. It looks like the Instagram set is, too, with influencers from every age bracket breathing new life into the print. A handful of young ones may not recall this plaid being big back in the ’90s (remember a particularly iconic campaign that featured Moss in her checked wedding gown? ), but many of the “new” ways girls are wearing the check lean toward that era’s streetwear aesthetic. A reworked check top from Burberry’s spring 2019 show. This iconic beige, white, black, and red plaid has been in existence since the 1960s and has been worn by the royal family and celebrities over the years. Whether you opt for a more regal, sophisticated route or tap into the street style culture, there are countless ensembles worth bookmarking for the future. Keep scrolling to see who’s wearing Burberry’s vintage check now, and then shop some of our favorite pieces. Style Notes: Entry price-point pieces such as pouch bags and scarves are proving to be particularly popular. They also offer an easy, subtle way into the trend. Style Notes: Combining iconic ’90s vintage pieces like Burberry checks with Chanel logos feels entirely right for now. Style Notes: Burberry’s bucket hats have been trending, but this totally rave-y getup is the first time I’ve seen one worn so boldly. Style Notes: When in doubt about print clashing, just go for the double (triple or quadruple) check. Style Notes: Some have been known to combine with other (non-Burberry) checks. That’s acceptable too. Style Notes: All of it, all at once. Yes, please. It works because the check is essentially quite neutral. Style Notes: Burberry’s checked shirts are being layered and styled in 101 ways. This idea of wearing one as more of a shacket ticks boxes for spring. Style Notes: What did I tell you already about wearing multiple checked pieces at once? Style Notes: Not everyone will feel like they can pull off Burberry check leggings and moon boots, but winter can do wild things to a wardrobe. Style Notes: The big tote bags have been getting a lot of Instagram love lately. Style Notes: Renata always offers a chic, grown-up way to style of-the-moment items. Style Notes: Even minimalists have cottoned onto the charms of a little check. Style Notes: Burberry’s coats are second to none, and this checked overcoat will last a lifetime. Style Notes: Pick out the colors in your chosen check and wear throughout your outfit. Next up, your guide to the most important designer bags of 2019.